If your dog's eyes seem itchy, this could be a symptom of anything from allergies to inflammation. Without a thorough veterinary examination, it's difficult to pinpoint the cause. In addition, untreated eye conditions can worsen and potentially cause permanent eye damage. Treating itchy eyes requires diagnosing the underlying cause and administering medications to ease the itchiness and treat what's causing them. A dog with itchy eyes might paw at his eyes or rub his face along surfaces such as furniture. Writing for petMD.com, veterinarian Dr. T. J. Dunn Jr. warns that seemingly minor eye problems could signal something much larger, while what looks alarming might be minor and easy to treat. Dunn adds that to be safe, owners should have any eye problem examined immediately. Also, if you see additional signs of inflammation, irritation or trauma, take your dog to the vet right away. WebMD notes that other symptoms, such as crusty eyes, uneven pupils, cloudiness in the eyes and changes in eye color, can all indicate a medical condition that requires treatment. Anything can create inflammation or irritation and cause your dog's eyes to itch. Allergies are a common culprit, and can include food allergies or a reaction to something in the environment such as a chemical or tree pollen. Eye infections can cause itching, as can anything that gets lodged in the eye. To determine the cause, your vet will examine your dog's eye and might collect tissue samples for further testing, Dr. Dunn notes. Your veterinarian might refer you to a specialist such as a veterinary ophthalmologist, who will have specialized equipment with which to examine your dog's eyes. Writing for the website Healthy Pets, veterinarian Dr. Karen Becker notes that dogs with itchy eyes can benefit from eye rinses designed to clear out the eyes and soothe itching. However, she warns that owners should choose one made specifically for pets and not use a human product unless they consult with a veterinarian. When treating the condition causing the itching, short-term medication may suffice or pets might need long-term, more intensive care. For example, PetMD notes that treating eye infections might require a topical or oral antibiotic, while treating allergies might require changing the dog's diet to determine if a food ingredient is causing the problem. 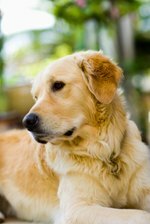 If an obstruction or tumor is causing inflammation, your dog might need surgery. Writing in The Huffington Post, veterinarian Dr. Donna Solomon noted that over-the-counter antihistamines can relieve allergy symptoms as well.